She's a Reve de Mer. I bought her years ago (30) on the river Hamble. 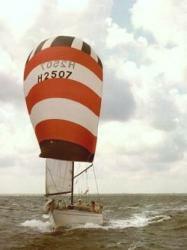 She's still a fast sailing boat, even more in light airs, though not as fast as those from a later generation. I sail her for cruising these days out of Willemstad, Netherlands.